I used two coats of After Party and two coats of Iris topped with one coat of Poshe. 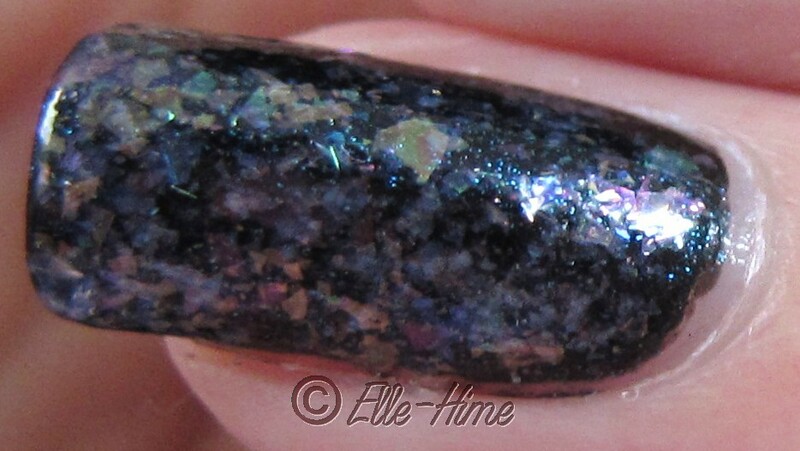 Both polishes contain flakies, which are tricky to capture, so I took several pictures. Read on to find out what I though of each one! First off, my base nail polish. 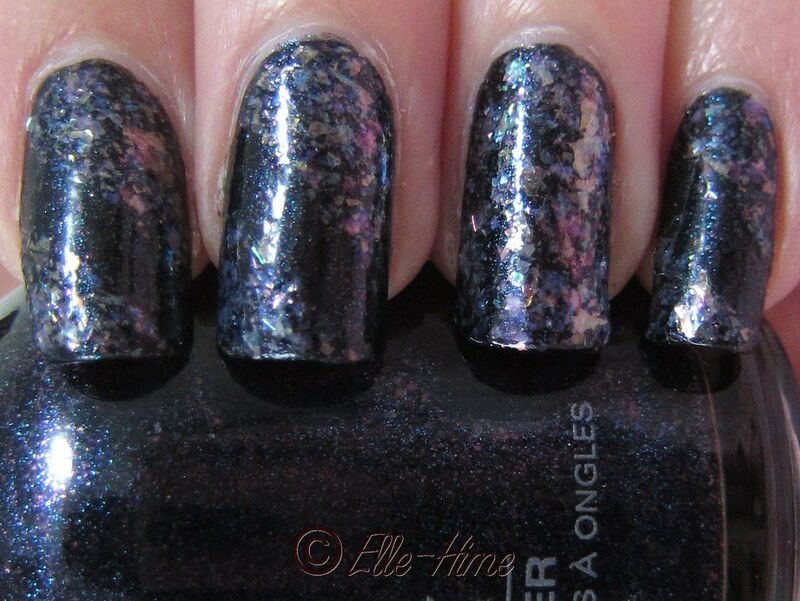 Orly After Party is a black creme filled with blue microshimmer and tiny flakes that shift from purple to pink. I recommend clicking the above pictures to see what I'm talking about. I had to use flash to make them come out clearly. This polish has awesome coverage and it only took two coats for full opacity. The glitter particles in the polish give your manicure a somewhat textured look though it dries perfectly smooth. I'm very happy with After Party. 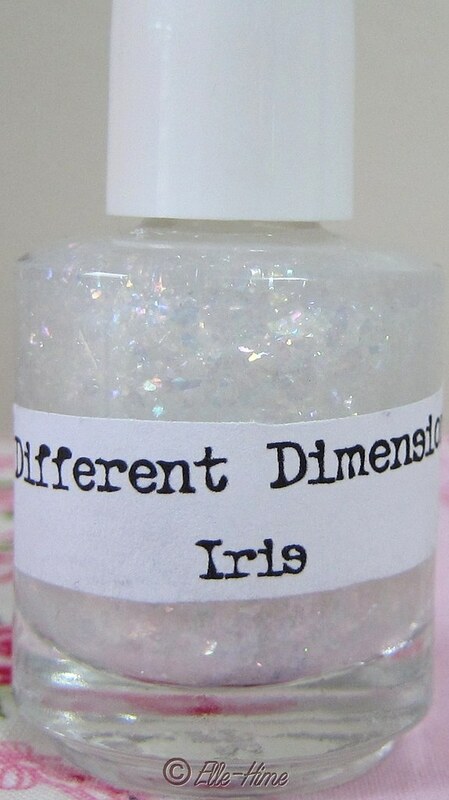 Different Dimension's Iris might not look like a whole lot in the the bottle, fooling you into thinking it is a mostly clear polish. It reflects a whole rainbow of pastel shades, however! Depending on how your nails catch the light each flake reflects a color or disappears entirely amongst its neighbors. Hard to describe and fairly subtle, but a really pretty effect! I don't have anything quite like it in my collection. The shredded glitter in Iris is very agreeable; you get a ton of it on your brush because it is positively packed in that bottle, and it even likes to lay flat and smooth for you - no snaggy glitter problems! I used two coats on my ring finger, but after seeing how easy it was to control I did some free hand art on my other nails. Impromptu diagonal stripes using nothing but the brush that comes with Iris. I dabbed the glitter where it needed to be in the tight spots on my nail, and it was easy to smooth out. My nail art was done in two coats as well so it would contrast more against After Party. No flash, which seems to show the pastel colors better! I couldn't decide which pictures I was happiest with, so you get them all! Using flash made the flakes stand out more crisply, but leaving it off is more color accurate. I really enjoyed wearing these polishes. Of course, I'm fond of black nails! After Party a black with something extra to jazz it up and is unique to me. I'm especially happy with Iris. It's concentration in the bottle will lend itself to being dabbed into more nail art designs in the future, and I'm also curious about wearing 2-3 coats over "naked" nails for a dreamy french manicure. What would you use it with? Love this layering combo - so pretty!